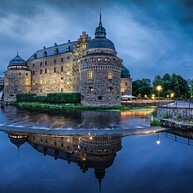 Örebro is an attractive city with well-preserved old areas along Svartån, the quiet river, and with new exciting architecture, business streets, pubs and cafés. And then there is ”Finrummet” at Storbron – with the grand Vasa Castle, the jewel of the crown. Within walking distance from the town centre, the beautiful seashore scenery of the lake Hjälmaren is waiting for you. And ten kilometres to the west, Kilsbergen, ”Blå Bergen” (the Blue Mountains), rise with promise of magnificent experiences. Örebro is a city full of culture and entertainment, so put on your most comfortable shoes and experience some exciting days full of activities that suits you. At the beach of the Svartå in central Örebro, we find the open-air museum Wadköping with environments from Örebro in the past. In the small farm buildings from the 17th-19th centuries there are craftsmen, shops, museums, a café and exhibitions. There are also other museum buildings like Cajsa Warg’s house and Kungstugan from the 16th and 17th centuries. Events all through the year. 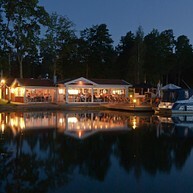 The waterside restaurant in Katrinelund is surrounded by wonderful nature and has stunning views of Lake Hjälmaren. From 12 till late, the kitchen offers an extensive menu with delicious and harmonious flavours. Take a walk, a swim in the blue or enjoy a cold beer on the jetty. Katrinelund is well worth the trip, there’s something for both adults and children. In the center of the city stands the stately Örebro castle, the gathering point in the city for more than 700 years. Once a simple castle for defense and prison, but during the Vasa era it was rebuilt as a magnificent, royal castle. Today the castle is an open tourist attraction, full of life, with tours, exhibitions, a restaurant and a café, as well as the Örebro Läns Museum exhibition during the renovation period of the museum's original building. 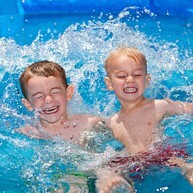 Gustavsviks Upplevelsebad (water world) is a fantastic experience in a jungle-like environment with Europe’s longest wild water fall, water slopes, aquarium lagoons and a pool area for the youngest visitors. In addition to the bath part, there is an exercise pool, solariums, gym and a wonderful outdoor pool area. Even a fishing pond with trout, a field for soccer and a beach volleyball area. Here is also adventure golfing for children, with buildings from Örebro. In 2005, Stadsparken was ranked the fifth finest park in Europe. In the year before, the park was voted to be the most pleasant park in Sweden. Experience the wonderful flowers and unwind in the restaurant or café at the Stadrädsgård. In the park you will also find Örebro’s largest playground. During the summer, there are daily guided tours of Örebro Castle, a trip to times gone by. Hear about nobles, prisoners and servants and of known and unknown episodes from the castle’s history.The rest of the year the castle has guided tours every Saturday and Sunday. 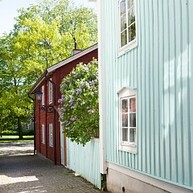 The cultural reserve Karlslund is a scenic area with a long history and is only five kilometres from Örebro centre. In this idyll you will find beautiful nature, cultural and industrial history, artisan towns, shops, a garden for children and in the old mill building there is a modern and exciting technological museum filled with experiences for the whole family. Just south of Örebro, lake Hjälmaren extends. It is best to enjoy this beautiful lake from a boat, so come along on one of the cruises which start from Örebro harbour. The idyllic Vinön is Hjälmaren’s largest island and a popular destination among the inhabitants of Örebro and tourists. Vägverket’s free ferry will take you there. 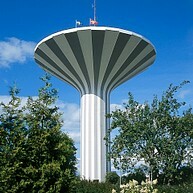 From the 50-meter high platform of the water tower ”Svampen,” you have an incredible view of Örebro and Närke, making it to one of the most popular tourist sites in the city. Here you will find a restaurant where to enjoy a good lunch buffet while admiring the amazing view. Stortorget (the town square) is one of Örebro’s most important historical places. 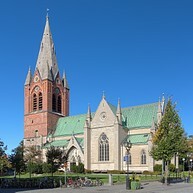 This is where St. Nicolai Church is, the city’s principal church since the Middle Ages, but also the place where Jean Baptiste Bernadotte was elected heir to the throne in 1810. The neo-Gothic town hall is also on the square with its glockenspiel, which in winter houses Sweden’s largest advent calendar. It is also here in front of the church, that the largest Christmas concert, O Holy night, is performed every year on the 2nd Sunday of Advent. Stora Holmen in Örebro is an island just for kids. Rent a pedal car and drive around in the miniature town. Run about in the play area or drop in on the animals. 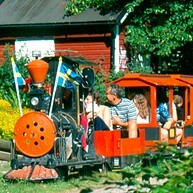 The miniature train that takes you round the whole island leaves from Trollebo Central. You can reach the island via bridges. 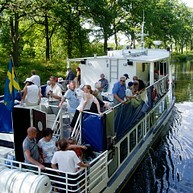 But it’s more fun to take the Wictoria ferry from Stadsparken in the summer.